Korean beauty products have been sending waves across the globe for being innovative, effective, and affordable. Although the beauty world has seen a lot of great new products in the last few years, one of the things that really took off are Korean face masks. I know, face masks aren’t exactly that new but the Koreans have taken it to a whole new level. No Korean beauty store is complete without a wall full of masks made with ingredients that range from tomato extract to bee venom. There are thousands of options for you to choose from depending on what your skin needs. While most of the face masks in the market are absolutely fantastic, it can be a bit difficult to find out which one to buy. Here at Beautyshortcutips.com, we’ve summarized some of the best and most effective Korean facemasks that you should definitely try out. Read about their benefits, pros, and cons to help you select the ones that are right for you. What Makes a Great Face Mask? 1. 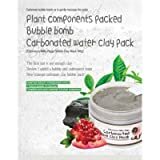 Elizavecca Milky Piggy Carbonated Bubble Clay Mask – a fun and unique deep cleansing mask made of carbonated water and clay. 2. Laneige Water Sleeping Mask – an overnight mask that leaves your skin feeling fresh and soft when you wake up. 3. Nature Rep﻿﻿ublic Aloe Vera Gel – a multi-purpose mask you can use to speed up your skin’s healing and treat sun burns. 4. 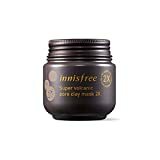 Innisfree Super Volcanic Pore Clay Mask – a deep cleansing mud mask that’s great for unclogging pores and removing dead skin cells. 5. 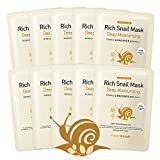 Mothermade Deep Moisturizing Rich Snail Facial Mask – face mask sheet infused with snail mucin — a substance that’s been proven to improve your skin’s elasticity and speed up the healing process. 6. 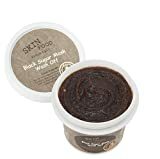 Skinfood Black Sugar Mask Wash Off Exfoliator – a cult favorite among Korean beauty lovers, this exfoliating sugar mask cleans your skin and removes dead skin cells and excess sebum to reveal healthy, glowing skin. 7. 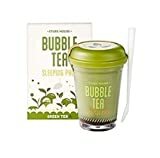 Etude House Bubble Tea Sleeping Pack – a fun and quirky sleeping pack for treating your skin overnight. The green tea extract in the pack provides some much-needed antioxidants to help keep wrinkles and fine lines at bay. 8. 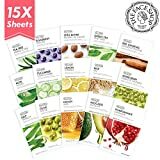 The Face Shop Living Nature Grind Mask Sheet – easy-to-use face mask sheets that are made from ingredients derived from fruits, vegetables, and other natural products. 9. Purederm Collagen Eye Zone Pad Patches – face mask specifically for treating the sensitive under eye area. Comes with collagen to help keep your under eyes looking youthful. You’ve probably seen this mask or something like it all over Youtube and Instagram. This a carbonated bubble mask that bubbles up on your face made of water and mud. The bubbling helps the product go deep clean your pores, minimize the occurrence of blackheads, and reduce its appearance. Skin care products work best at night because that’s when your skin repairs itself. So besides getting a good night’s sleep, having some great products on your nightly routine can mean the difference between looking dead-beat or fantastic when you wake up. The Laneige Water Sleeping Mask has an almost cult-like following among K-Beauty lovers for being so light and moisturizing — two things you want to have in a sleeping pack. Just put a generous amount on your face before you sleep and wake up looking better and brighter! This isn’t just an awesome face mask. Nature Republic’s Aloe Vera Gel is also great as a moisturizer, primer, and for soothing sunburns. Innisfree is one of my favorite Korean brands. They make great products that are inspired by nature and made with natural ingredients. This Volcanic Pore Clay Mask uses mineral-rich clay to nourish the skin while removing excess sebum and dead skin cells. It’s also great for minimizing pores and getting rid of blackheads. If you think playing with snails is reserved for those slightly gross kindergarten kids making mud pies, think again. Snails mucin has been scientifically proven to help aid in the skin’s healing process — leaving it looking clear and youthful. This face mask from mothermade is great for harnessing the benefits of snail mucin without having to put an actual snail on your face. Just take the cotton mask, leave it on your face, and let your skin absorb all the goodness. This is one of my go-to products that I simply can’t live without. It’s a great exfoliator and leaves your skin feeling nice and smooth. The black sugar is also rich in vitamins and minerals so you get a lot of good stuff while washing away dead skin cells! Etude House is known for its great products and quirky packaging. Their Bubble Tea sleeping pack isn’t just something you’ll love on your skin, you’ll love having it on your vanity table as well! It’s a great product for keeping your skin moisturized while sleeping without the extra oiliness. The green tea sleeping pack is particularly good for those dealing with fine lines and wrinkles as green tea is very rich in anti-oxidants that reduce the signs of aging. The skin under your eyes is extremely sensitive and are most prone to showing signs of aging as early as your 30s! This is because the skin under the eyes are very thin and with the stress of everyday life, it’s easy to develop wrinkles and dark circles. This under eye mask from Purederm is packed full of collagen that helps keep your skin’s natural youthful glow. This product is great for those who wants to improve the appearance of dark circles. The Face Shop offers products that uses ingredients derived from nature. Their face mask section looks more like a buffet than a beauty store. You’ll see packages with pictures of tomatoes, cucumbers, green tea, and even bees! They have such a wide selection of mask sheets you can go for days without repeating the same one. What’s more, you can customize your routine without spending on large bottles of serum depending on what your skin needs. The effectiveness of a face mask varies from person to person. While one product may work great for you, it might not do the same thing for your friend. This is because Korean face masks are designed to target specific skin problems such as dryness, hyperpigmentation, large pores, etc. However, there are three characteristics that we at Beautyshortcutips.com believe every face mask should have. This is one of the most defining characteristics of Korean skin care: natural ingredients. Koreans have this belief that if it’s not safe enough for you to eat, then it’s probably not very good for your skin. Many Korean cosmetic brands took this saying to heart and uses ingredients derived from fruits and vegetables for their face masks. While gimmicky cosmetic products are really fun to use and experiment with, going with classic and easy-to-use products is better in the long run. After all, face masks are made for those on-the-go for a quick and effective way to pamper the skin. Having a product with more than two steps would completely defeat that purpose. Like every other cosmetic product, going for non-animal tested products is always a huge plus. It’s kind of hard to enjoy your night of pampering and relaxation when you know innocent animals had to suffer for you to have it. Thankfully, Korean cosmetics are changing the game and a lot of brands are turning towards being more vegan friendly. After much debate, we’ve decided that the Laneige Water Sleeping Mask is our top pick for the best Korean face mask in the market. It’s a product that’s popular for its effectivity and it satisfies the three characteristics of a great face mask. I was looking for a good Korean face mask for acne treatment, a friend got this innisfree green tea extract. It worked well but am not satisfied with the results. I will try another from this list.